The International Maritime Organization (IMO) is moving forward with a marked reduction from 3.5% to 0.5% in the maximum sulfur content of marine fuel (bunker fuel oil) on January 1, 2020. In our November 2017 newsletter, Stillwater provided Part 3 of our series on this “IMO 2020 Rule,” focusing on the refiners’ perspective. In this month’s newsletter, Adrian Tolson from 20|20 Marine Energy joins the conversation as we focus on the bunker fuel suppliers’ and blenders’ perspective on this impending change, with particular emphasis on the impact of the IMO 2020 Rule upon implementation. Implementation of the IMO 2020 Rule will require marine vessels to consume marine fuels with a maximum sulfur content of 0.5 weight percent (wt. %) in areas outside of Emission Control Areas (ECAs), unless onboard stack gas scrubbers have been installed. Stillwater and 20|20 Marine Energy expect that no more than 5% of marine vessels will have installed onboard scrubbers when the IMO 2020 Rule takes effect. Stillwater also expects that non-traditional fuels, such as LNG and methanol, will constitute a very small percentage of vessel fuel in 2020. As a result, IMO 2020 will cause a dramatic shift in the demand of marine fuels used globally from high sulfur fuel oil (HSFO) to 0.5% sulfur marine fuel. This demand shift from traditional bunker fuels to marine fuels that are predominantly not residual oil-based will have a dramatic impact on global marine fuel supply composition, market pricing, and supply patterns. 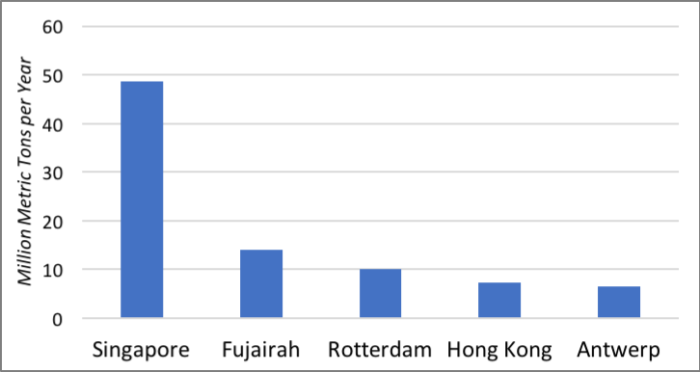 Of the roughly 300 million metric tonnes (MMT) per year of bunker fuel currently consumed globally, 30% is handled through just five ports: Singapore, Fujairah, Rotterdam, Hong Kong, and Antwerp. IMO’s Revised Marine Pollution (MARPOL) Annex VI rule reduced the maximum sulfur content of bunker fuel oil to its current 3.5 wt. % specification in 2012. According to data provided to the IMO, global average bunker fuel sulfur content is currently about 2.45%. So the IMO 2020 Rule with marine fuels limited to 0.5% sulfur content in open ocean areas (e.g. excluding Environmental Compliance Areas in North America and Europe) will reduce global average sulfur content of marine fuels consumed by more than 80%. The last half of 2019 and most of 2020 are likely to exhibit much less market stability from both product supply and pricing perspectives than the timeperiods before and after this transition period to IMO 2020-compliant marine fuels. Many key hydrocarbon price differentials among marine fuels, land transportation fuels, and crude oil grades are likely to change markedly versus what has historically been typical. Fuel quality and compatibility concerns may well be factors that significantly affect shipowners choices for IMO 2020-compliant fuels sourcing. Marine fuel suppliers and blenders will find that building on existing relationships with current suppliers (refiners) and customers (shipowners) will serve them well during and after the transition process to IMO 2020-compliant fuels. By early 2019, shipowners will develop initial plans for transitioning to compliant marine fuels post- implementation of the IMO 2020 Rule. They will be challenged to clean out their fuel systems during the last half of 2019, perhaps starting as early as September. Many will likely opt to operate on 100% marine gas oil (i.e. diesel) during this clean-out timeframe and the first few months of 2020. During this timeframe, shipowners will be fine-tuning their initial plans for fuel sourcing beyond the IMO 2020 Rule implementation transition period. Fuel quality (e.g. viscosity), stability, and compatibility will be key considerations in addition to fuel cost and availability. The key question is how quickly will shipowners feel confident enough in the quality and consistency of their marine fuel supply network to begin consuming compliant fuels that are blends rather than 100% marine gas oil, motivated by the driver to minimize marine fuel consumption costs where possible. This shift away from 100% marine gas oil could take several months for some shipowners. These shipowners may even opt to continue utilizing marine gas oil beyond this interim period for reasons such as certainty of supply, quality concerns, and tank segregation issues. For some smaller ports, marine gas oil might be the only open ocean-compliant marine fuel provided post-2020. Marine fuel suppliers and blenders will need to keep abreast of shipowners’ plans in order to seamlessly meet shipowner requirements. With the European market as a whole in a distillates-short position and Asia as a significant processor of high sulfur crudes utilizing relatively non-complex refineries (and producing high sulfur bunker fuels), marine fuel supply patterns are very likely to change as the IMO 2020 Rule rolls out. Market prices and product availability shifts will be significant enough to cause shipowners to re-optimize the mix of ports utilized to service their needs. Marine fuel suppliers and blenders will need to be proactive in keeping abreast of market dynamics, shipowner re-optimization economic drivers, and refinery output changes. This issue is liable to be volatile through the first six to nine chaotic months of transition. Marine fuel suppliers and blenders will be advantaged if they can leverage existing relationships with shipowners before and during the transition period. The desired mix of spot and term supply contracts may change for some shipowners during the transition period. Six-month or one-year term supply contracts may become more popular versus spot purchases that currently represent the majority of market supply. Addressing shipowner fuel quality, stability, and compatibility concerns during the transition period and beyond will also be important in relationship-building. The 650°-1050°F portion of the crude oil barrel that is currently commonly processed on catalytic cracking and hydrocracking units in refineries. These could be unhydrotreated blendstocks if from sweet crudes or hydrotreated blendstocks if from higher sulfur crude mixes. Strengthening working relationships with key suppliers (refiners) will position marine fuel blenders to create a blending flexibility competitive advantage. Capitalizing on changing marine fuel blends composition will require marine fuel suppliers to assess how existing tankage can be redeployed in the post-IMO 2020 Rule environment to create a competitive advantage with customers. Existing tankage may be poorly configured in many facilities for a post-IMO 2020 environment. An economic driver to invest capital for tankage additions or reconfiguration will likely arise in some markets. In other markets facing reduced supply volumes of marine fuel due to market dynamics, an oversupply of tankage may arise. IMO’s Pollution Prevention and Response (PPR) sub-committee is grappling with the IMO 2020 enforcement issue. PPR is likely to place on marine fuel suppliers the responsibility for certifying that marine fuel complying with the IMO 2020 Rule has been loaded on each vessel. The next PPR meeting is scheduled for February 2018, so more insights in this area may be forthcoming. 2020 is likely to be a year of chaos for the marine fuel supplier and blender as new blends and supply patterns begin to emerge, as product stability and compatibility issues are addressed, and as market pricing moves toward re-stabilizing. For some marine fuel suppliers and blenders, this is an opportunity (e.g. large commodity traders/blenders). For others, it can be a threat. Global sourcing, optimization, and flexibility will have value for marine fuel suppliers and blenders. Whether you’d like to develop a better understanding of the IMO 2020 Rule and initial compliance methodology or you’re interested in collaborating to better define your strategy and tactics, Stillwater Associates and 20|20 Marine Energy are here to help. We invite your questions and comments on this evolving significant issue. This reduction excludes HSFO that can continue to be consumed on vessels equipped with onboard stack gas scrubbing faciltiies and also excludes non-compliant HSFO consumption.